Let’s face it, we all want a greenhouse – well, one-half of the adults in all our households want one, anyway – but even small ones seem expensive, and the bigger drawback is space. Connect it to the house in a sunny spot, and it’s fine for seven months, but in the way – or battered by snow – for winter. And what if you just want a temporary greenhouse out in the back yard, away from the house, during spring and summer? Constructing and deconstructing each year is out of the question. Problem solved with the The Germinator. Ran into this product at a trade show, and it blew me away. What you have here is the only truly collapsible greenhouse on the market, meaning you can store it in winter. How much storage space do you need? The hinged aluminum frame collapses to a mere eight-inch width. 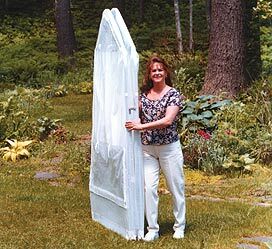 You could literally store it under a king-size bed, if you could get it into the bedroom. This is a patented, well-designed product manufactured from high quality materials. The tear resistant cover is made of a high density, polyester reinforced, polyethylene laminate that is waterproof and UV treated for lasting durability. Sewn-on kick guards protect the bottom corners and door entry. The product has ample large, screen-covered vents. The large, zippered door is wheelchair accessible, held open with Velcro fasteners, and can be opened with one hand. The greenhouse comes with a two-tier, full-length shelf system that holds up to 24 flats. You can customize your Germinator with a second shelf system that doubles capacity. Just as amazing is the price. 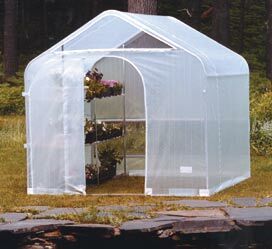 The greenhouses come in two sizes, 5’ x 8’ for $425.00 and 8’ x 8’ for $495.00. The accessory kit to double shelf capacity is $85.00. They are shipped via UPS from the manufacturer, and since the 8’ x 8’ in the shipping box only weighs fifty four pounds, your shipping cost will only run $30 to $55. The 5’ x 8’ can ship for as little as $25. First time set-up takes under two hours and all you need is a standard drill and pliers. After that, setting it up and taking it down is measured in mere minutes. Best feedback and customer satisfaction reports have come from the people at Johnny’s Selected Seeds, who did a small mailing about the product to selected customers. They sold quite a few, and feedback cards that came back from users were extremely positive. The Germinator comes with a two-year warranty. You can order direct from the manufacturer, the 112 year-old Anchor Industries, Inc., in Evansville, Indiana. They happen to be the world’s largest and oldest tent and awning manufacturer, so you’re not dealing with some new skittering start-up, here. Visit their website at www.germinators.com, phone toll-free 1-866-343-7646 to order.